It’s been like running a marathon this Christmas and New Year – cooking, eating, cooking and eating again. Then, with the spike in heat and humidity in Sydney lately, it’s hard to get the enthusiasm to cook or eat anything. With the weather like this, you really appreciate the genius of Vietnamese food, which is all about freshness and, with its irresistible combination of spicy, sweet and sour flavours, seems to have a restorative effect when the hot and sticky weather hits. 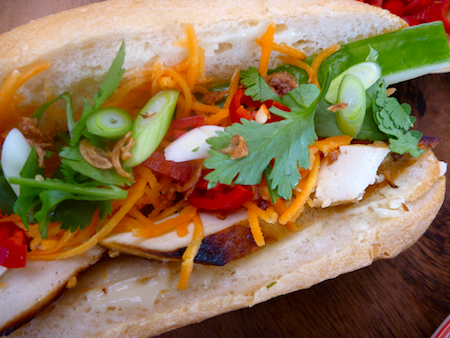 The banh mi roll is a Vietnamese/French flavour fusion in a baguette. It’s basically a herb and salad roll made traditionally with pork pate and sliced meat but with this vegetarian version with marinated tofu slices, you don’t feel like your missing anything. In fact, the lightness of the tofu seems like a positive. 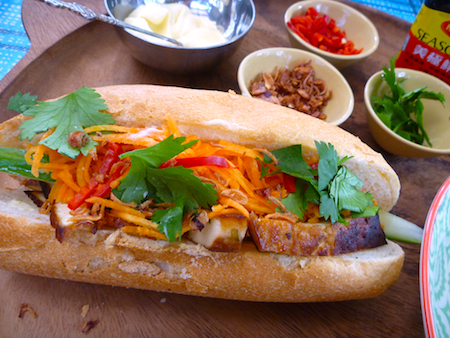 Sydney seems to be slightly obsessed with banh mi at the moment – my local shopping strip seems to have about half a dozen bakeries hawking some version of Vietnamese pork roll. Don’t be put off by the meaty advertising – most shops offer some kind vegetarian version. Rolls on Oxford in Darlinghurst even has a rather deluxe vego version featuring vegan meat and pate but even my simpler local offerings, with the cheese, salad, fresh herbs and dressing, are pretty bloody delicious. Since I discovered how easy it was to make a vegetarian version of these rolls at home, I’ve gone on a bit of a banh mi bender and have been making them quite a lot recently. They are great for feeding a crowd – just gather together all the fixings and let people assemble their own rolls to taste. 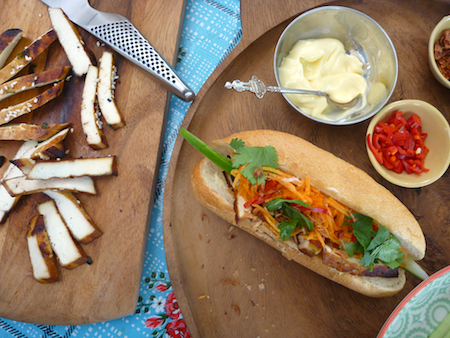 There are a few essentials for making banh mi at home – you need some kind of vegetarian protein. I generally go for a marinated tofu but fried tempeh is also good. The Hoisin barbecued tofu steaks I posted last year work really well, as does the quick carrot and cucumber pickle which gives a not so authentic but a very complementary lift to your banh mi. The last few times I’ve made banh mi though, I’ve used Deborah Madison’s sesame marinade, which is a lovely light alternative to the heavier Hoisin marinade. Once you’ve got your protein sorted, you’ve got to prepare your fixings. Good mayonnaise is essential. You can make your own but I generally use the Japanese Kewpie mayonnaise, which comes in a handy squeeze bottle (which is great if you’re assembling a banh mi buffet and feeding the masses). 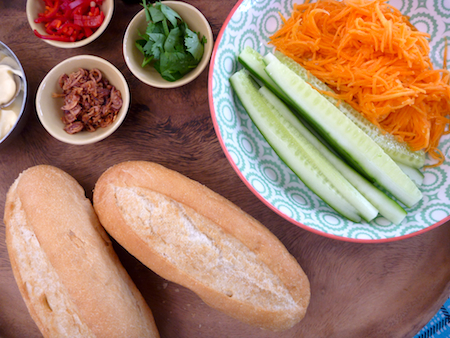 FInely sliced green onions, cucumber batons, shredded carrot (preferably lightly pickled in brine – see recipe below) and fresh herbs, coriander, Vietnamese mint, basil, or a combination of all three are all good. You can stop there but I generally add some iceberg lettuce for extra crunch and some deep fried shallots for extra texture … and if I’m in the mood, some Dijon mustard (just to up the French influence in lieu of the pate). The final addition is a drizzle of Maggi seasoning or soy sauce for a that final umami spike of flavour. And there you have it – the perfect summer time vegetarian barbecue. You can use this marinade as a sauce for noodles, or a marinade for vegetables or tofu. Whisk together all ingredients, adjust for taste and sweetness. 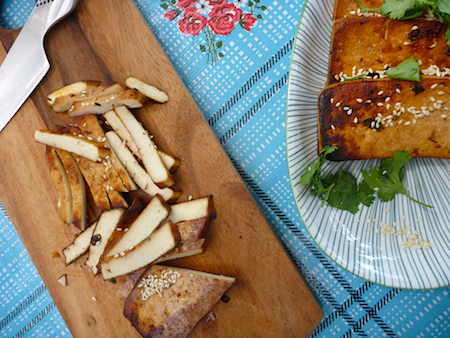 If using to marinate tofu – slice a 750 gram packet of firm tofu into 1 cm slices. Marinate in container turning and rotating the tofu occasionally for at least two hours. The tofu can also be marinated overnight. Saute in a heated cast iron pan or on barbecue grill in a little light vegetable or olive oil. In a Tupperware container, dissolve sugar, salt in warm water and vinegar. Adjust salt and sugar if you want it a little more salty or sweet. Place carrot in water and let rest for at least an hour. Drain carrot and use for sandwiches. Any leftover carrot can be kept in the brine for up to two weeks. Split baguettes into half and slather with mayonnaise. 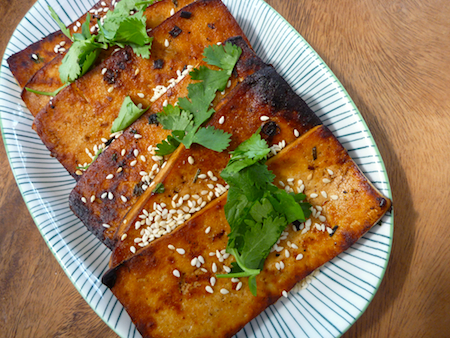 Layer on tofu, then shredded carrot garnish with sliced green onions, herbs and sliced red chilli. Drizzle with a little Maggi seasoning or soy sauce for a final unami spike.